The small group of Old School Presbyterians from Fremont, Ohio were under the guidance of Presbyterian missionary William Wynkoop McNair. Rev. McNair hand been sent by the Presbyterian Board of Home Missions to Wisconsin to establish churches in this area. Twenty-five year old McNair had had a busy spring. He graduated from Princeton Theological Seminary on May 16, 1849, was ordained on the 17th by the Presbytery at Pennington, N.J., was married on the same day and arrived in Milwaukee in early June to begin his work. He lived in a barn until his house was finished in Portage that fall, preaching in the garrison school at Fort Winnebago, at Veeder’s Point and in various places in Dekorra township. Rev. 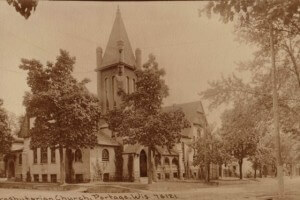 McNair would go on to preach in the area, founding the “Portage City Classical Institute,” a Christian education school, in 1853. He explored the country between Wisconsin and Mississippi Rivers, being the first Protestant minister to preach in the Chippewa Valley. He founded churches in Oxford, Eau Claire and Chippewa Falls. Meanwhile the little group of families at the Presbyterian Church – John and Almira Johnson, Chauncey (C.J.) and Caroline Pettibone, Hiram Pettibone, George and Anna Wall – were joined by John and Elinor Jones and Mrs. Emily Best on July 14, 1850 as the charter members of the congregation. They received aid from others – Dr. C.G. 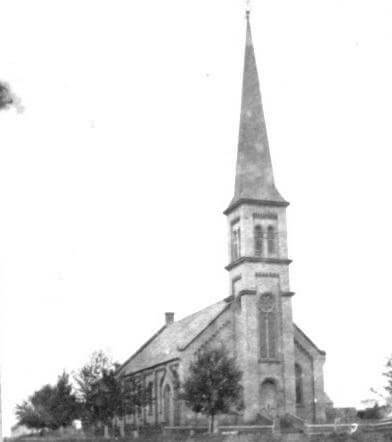 and Harriet McCulloch, Decatur Vandercook and Lemuel Berry, among others – who helped them begin building a frame church on the southeast side of Cook Street opposite what is now the John Roche / Columbia County Law Enforcement building. They worshiped there until, in 1854, a committee, along with Rev. 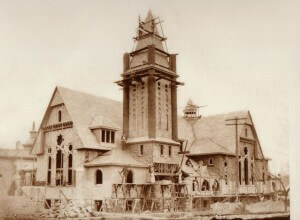 McNair made plans for a new church. This brick edifice on the northeast corner of Adams and Cook streets cost $13,000.00 and was dedicated in February, 1856. This building continues in use today, serving as the Portage Center for the Arts facility.